The dark cloud of relegation which has been hovering over Priory Lane for the past month grew predominantly thicker as a late goal floored Borough for the second successive week. Just two points now separate Mark McGhee’s men from those fateful last three places and with promotion candidates to face in the remaining games, The Sports will need to produce something special if Nationwide South football is to remain in Eastbourne next season. Saturday’s first half performance against fellow strugglers Gloucester must rank as among the worst of the season. The standard of football from both sides was awful - in stark contrast to recent weeks when decent Borough performances have been left unrewarded. 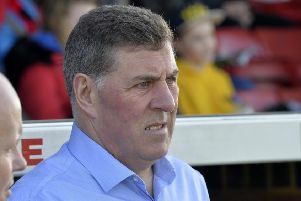 Careless distribution and too many balls hopefully hoofed into the air must have given interim boss Mark McGhee plenty to think about at the start of crunch month. This was a match neither side could afford to lose and neither side looked as if they were going to as clear-cut chances were just about non-existent in an opening 45 minutes in which only an ugly brawl triggered by Kane Wills’ reaction to a foul by Dejon Noel-Williams kept the crowd awake. It all ended with a couple of yellow cards, a tally which reached five by half-time – three for Gloucester and two for Borough (Walker and Josh Bingham). The biggest cheer so far came at the start of the second half with the announcement that Lloyd Dawes had replaced Bingham. 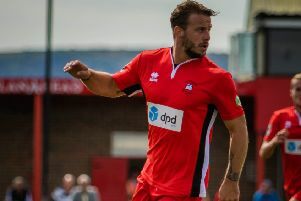 And Dawes certainly added energy to the Borough team who took the lead in the 51st minute, A long throw from the right by Toby Adebayo-Rowling reached Stefan Ljubicic whose nod-on found an unmarked Charlie Walker in an ideal position to smash into the back of the net from close range. Instead of 2-0 it was 1-1 in the 63rd minute when Noel-Williams fired home on the turn after two shots had been blocked by the desperate home defence. But despite Dawes’s effort and energy, the striker wasted two glorious chances to emphasis Borough’s finishing weaknesses this season. At 89 minutes came the moment the hosts must have dreaded. Home keeper Sam Howes got a good hand on Jake Jackson’s low drive from outside the area but it wasn’t strong enough and the ball rolled almost apologetically into the back of the net. So to the remaining four games against champions-elect Torquay, Dartford, Slough and Concord – just where are points coming from to prevent a dive into the Bostik League next season? Speaking after the match, Charlie Walker said, “We are doing everything we can to get the win. The first half was scrappy, it was never going to be pretty. “Second half we started well and we got the goal. But when we are in this position, things go against you. We have just got to stick together. We are in a tough fight for our last few games.